Well, the weekend may be officially over, but I think I still kept my promise erin! It’s everything I hoped it would be! Comfy, perfect fit, and certainly eye-catching. The yarn was lovely to work with, a bit dry-feeling from the silk but beautiful nonetheless. I made the smallest size of the sweater, knit at a very slightly tighter gauge, which loosened up upon blocking. There was so much going on at once I had to write out a row-by-row guide! It certainly made things easier, though. My back neck seam, which I thought I’d have to redo after blocking, actually lies very well. And the medallion? Super easy to do, once you figure out the instructions (I had a bit of a snafu but still managed to finish it within an SnB evening). All in all, a great knit. And the buttons? I got ’em at Fabricland, and you know, they’re perfect. Some may notice that it looks like I’m missing a button at the top of the band – and you’d be right. I only bought 6 buttons but actually needed 7. Eh, I can live without it. It’s not like I’d have done up the top button anyway! And in new yarn – spun up a skein of merino in violets with a touch of blue. DIY light tent of the day – white pillowcase. I wonder if my mom would miss it if I cut it up to build a sturdier light tent? 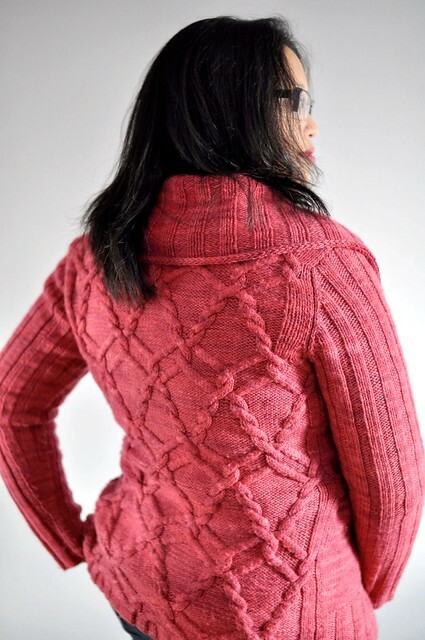 I think this is the first time I’ve seen this pattern knit up, and it’s GORGEOUS. It does fit you perfectly, everything about it looks perfect. And those buttons! I think a lot of people (including me!) are going to give this pattern a second look after seeing yours. Well done. that sweater is awesome. i love her designs. What a fun pattern – it’s like superman. From the front, a plain cardigan. From the back, cool. And the light tent is brilliant. I had so many issues photographing in the rain this weekend, I might have to go that route. you did an amazing job! that’s one of my favorite patterns in the book and now Im even more excited about it. if your mom is anything like my mom, then she’ll notice right away. Your Dreamcatcher looks great! I bet it feels scrumptious, too. What a gorgeous sweater! I especially love the way it fits you. Very encouraging, because I don’t think this cardigan is particularly flattering on either of the models in the book, which has kept me at bay from this project. Now you’ve gotten me all pumped up about making one of my own. This is also the first time I’ve seen this knit up – and it’s beautiful!! The color is gorgeous, too. yes! the dreamcatcher looks great! its always nice to see the loop-d-loop patterns in a real context (since the books photos are… a little awkward, hehe). looks great! you pumped this one out. Once again, simply fantabulous! What an interesting knit, and it fits you wonderfully! Beautiful job on the Dreamcatcher cardi! I have the book, and when I saw that pattern I really liked it, but figured it was one of those concept pieces that “real people” don’t wear – boy was I wrong! Looks great. wonderful spirit, very interesting and drapes beautifuly on you!! the color is smashing! What a unique sweater! I love the fit of it, too. I’ve been trying to decide if I should try the Denise Interchangeable needles. Do you love your set? Oh how very pretty this sweater is… I love it… and it does indeed resemble a dream catcher.